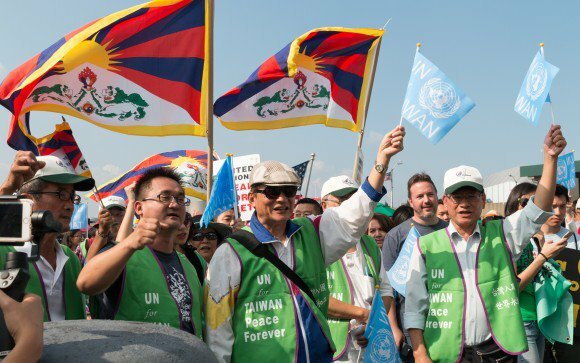 UNPO: Taiwan: Activists and Expatriates Protest Exclusion From U.N and Wider Formal Recognition. Taiwan: Activists and Expatriates Protest Exclusion From U.N and Wider Formal Recognition. On 16th September 2017 a protest was held in New York to highlight the injustice present in the continuing exclusion of Taiwan from international bodies, specifically the UN. Lead marcher and president of Taiwan United Nation Alliance, Michael Tsai, asks why Taiwan is still excluded considering Palestine’s admission as an observer. Mr. Tsai identifies the Chinese government as the biggest obstacle in achieving Taiwanese recognition in the UN. More than 500 Taiwanese took to the streets in New York City on Saturday to protest Taiwan's exclusion from the United Nations and other international organizations and China's role in blocking Taiwan's efforts to join those bodies. The protest, organized by the New York-based Committee for Admission of Taiwan to the U.N., was joined by a group from Taiwan consisting mainly of members of the Taiwan United Nations Alliance (TAIUNA) and Taiwanese expatriates living in the New York area. TAIUNA President Michael Tsai (蔡明憲), Democratic Progressive Party lawmakers Chang Hung-lu (張宏陸) and Yu Wan-ju (余宛如), and New Power Party lawmaker Hsu Yung-ming (徐永明) were among the protesters who marched along 42nd Street toward Dag Hammarskjold Plaza, chanting the slogans "U.N. for Taiwan" and "Keep Taiwan Free." "No one should be barred from the U.N.," said Tsai, arguing that even Palestine, which he described as a "non-state entity," was able to join the global organization as an observer two years ago, so "why can't Taiwan?" The protest was held to coincide with the 72nd Regular Session of the UN General Assembly, which is being held at UN Headquarters in New York. In a demonstration outside the Chinese embassy in Washington D.C. last week, Tsai criticized the Chinese government as the biggest barrier blocking Taiwan from the U.N. and other international organizations. Taiwan has tried without success to re-enter the U.N. since 1993, after losing its seat in the international body to the People's Republic of China in 1971.